Great Primitives By Kathy Box Sign. Cities throughout Wisconsin listed in the background. 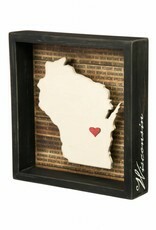 You place the little wooden heart included where your heart lies in Wisconsin! Measures: 7.75" x 8.5" x 2"